Clonorchis sinensis (C. sinensis, Cs) is a trematode parasite that often causes chronic cumulative infections in the hepatobiliary ducts of the host and can lead to pathological changes by continuously released excretory/secretory proteins (ESPs). A T2 ribonuclease in trematode ESPs, has been identified as a potent regulator of dendritic cell (DCs) modulation. We wondered whether there was a counterpart present in Cs ESPs with similar activity. To gain a better understanding of Cs ESPs associated immune responses, we identified and characterized RNASET2 of C. sinensis (Cs RNASET2) in this paper. We expressed Cs RNASET2 in Pichia pastoris and identified its molecular characteristics using bioinformatic analysis and experimental approaches. The immune modulation activities of Cs RNASET2 were confirmed by evaluating cytokine production and surface markers of recombinant Cs RNASET2 (rCs RNASET2) co-cultured DCs, and monitoring levels of IgG isotypes from rCs RNASET2 administered BALB/c mice. Cs RNASET2 appeared to be a glycoprotein of T2 ribonuclease family harboring conserved CAS motifs and rich in B-cell epitopes. Furthermore, Cs RNASET2 was present in Cs ESPs and was able to modulate cytokine production of DCs. In addition, rCs RNASET2 could significantly suppress the expression of lipopolysaccharide-induced DCs maturation markers. In addition, when subcutaneously administered with rCs RNASET2 there was a marked effect on IgG isotypes in mouse sera. Collectively, we revealed that Cs RNASET2, a T2 ribonuclease present in Cs ESPs, could modulate DCs maturation and might play an important role in C. sinensis associated immune regulation in the host. Clonorchiasis, caused by the infection of Clonorchis sinensis (C. sinensis), is highly epidemic in several Asian countries. More than 35 million people are infected with C. sinensis globally . Clonorchiasis is predominantly caused by ingesting raw or undercooked freshwater fish harboring metacercariae . When ingested by the host, larvae excyst in the duodenum and then migrate into the peripheral intrahepatic bile ducts to develop as adult worms . C. sinensis adult worms can thrive for more than 10 years in humans . People infected with C. sinensis are often asymptomatic, however, repeated and chronic infections can eventually lead to various hepatobiliary symptoms and complications. During the long term of parasitism, the liver flukes continuously release excretory/secretory proteins (ESPs), a cocktail of hundreds to thousands of bioactive proteins. Prior studies have demonstrated that the components of ESPs from C. sinensis (Cs ESPs) are implicated in biological processes especially the induction of host immune response , which may be intimately associated with formation of cholangitis, liver cirrhosis and cholangiocarcinoma (CCA) . Owing to its carcinogenicity, C. sinensis has been regarded as a group I carcinogen of cholangiocarcinoma . T2 ribonucleases are transferase-type RNase and distribute broadly in almost all groups of living organisms including bacteria, fungi, virus, plants, and animals . All of these enzymes have diverse biological activities, such as degradation of self-RNA, clearance of nucleic acids, serving as extra- or intracellular cytotoxins, and regulation of host immune responses [8–10]. Numerous studies have been conducted to characterize the biochemical properties and immunoregulatory roles of a T2 ribonuclease (omega-1) in Schistosoma mansoni (Sm omega-1), which is present in soluble egg antigens (SEA) of S. mansoni, formed by egg released ESPs [11–13]. Sm omega-1 could trigger Th2 response by modulating dendritic cells (DCs) phenotype, structure and protein synthesis [14–16]. Moreover, Sm omega-1 has been reported to induce priming of Foxp3+ Tregs, which play crucial immunoregulatory roles in the process of S. mansoni infection . Interestingly, the function of Sm omega-1 to enhance Foxp3 expression also depends on the alteration of DCs. These findings illustrate that Sm omega-1 is a key component of ESPs to modulate host immune responses, which is elicited by DCs alteration. DCs are defined as professional antigen-presenting cells serving as the sentinels of the immune system and have the unique capacity to induce and coordinate both innate and adaptive immune responses [18–22]. These findings give us insight into interactions between a secreted antigen and DCs, leading us to gain a better understanding of helminth associated immune responses. In the present study, we expressed and characterized C. sinensis RNASET2 (Cs RNASET2). We investigated the effects of rCs RNASET2 on bone marrow derived dendritic cell (BMDCs) modulation. In addition, we evaluated humoral immune responses initiated by rCs RNASET2 in BALB/c mice. Based on these observations, we proposed that Cs RNASET2 was intimately associated with C. sinensis-triggered immune response in the host. Female 6- to 8-week-old BALB/c mice and SD rats were obtained from the animal center of Sun Yat-Sen University (Guangzhou, China). The animals were housed in a pathogen-free facility. All animal experiments were conducted under Animal Care and Use Committee of Sun Yat-sen University (Permit No: SCXK (Guangdong) 2009–0011). The full-length encoding sequence of Cs RNASET2 [Accession No. GAA50115.1] was downloaded from GenBank in NCBI [http://www.ncbi.nlm.nih.gov/]. Homology analysis was performed using the blastx program [http://blast.ncbi.nlm.nih.gov/]. The molecular characteristics and the functional domains of Cs RNASET2 were assessed using proteomics tools provided by Expasy website [http://www.expasy.org/]. The alignments of the deduced amino acid sequence and T2 amino acid sequences from other species were performed by the software Vector NTI suite 8.0. Recombinant Cs RNASET2 was expressed in P. pastoris according to the manufacturer’s protocol (Invitrogen, USA). RNase activity of rCs RNASET2 was identified, and deglycosylation assay of the protein was carried out with PNGase F (New England BioLabs, USA). We collected Cs ESPs referring to the protocol as previously described . Each BALB/c mouse was immunized subcutaneously with 100 μg rCs RNASET2 or ESPs, which were respectively emulsified with complete Freund’s adjuvant at the first injection. Two booster injections at 2-week intervals were performed with 50 μg of proteins, which were emulsified with incomplete Freund’s adjuvant. After 2 weeks of the final boosting, anti-sera were collected and antibody titers were determined by ELISA. All anti-sera samples were split and stored at - 80°C. rCs RNASET2 and Cs ESPs were subjected to 12% SDS-PAGE, and subsequently electrotransferred onto the PVDF membranes (Millipore, USA) for 1 h at 100 V. The membranes were then blocked with 5% skimmed milk in PBS for 2 h at room temperature, and incubated with myc-epitope monoclonal antibody (1:1000 dilutions), his-tag monoclonal antibody, mouse anti-rCs RNASET2 sera (1:2000 dilutions), mouse anti- ESPs sera, naïve mouse and C. sinensis-infected mouse sera (1:100 dilutions) respectively. The membranes were then incubated with peroxidase-conjugated goat anti-mouse IgG (Proteintech, USA, 1:10,000 dilutions) for 1 h at room temprature. The reactions were visualized by enhanced chemiluminescence (ECL) method. Femurs were obtained from BALB/c mice and the muscle tissues were removed with scissors. The bone marrow cells (BMCs) were isolated by flushing the bone marrow with chilled RPMI-1640 medium. Red blood cells were lysed with red blood cell lysing buffer (Sigma, USA). The remaining BMCs were washed twice and then resuspended into 2 × 106/ml. BMCs were cultured in complete RPMI-1640 supplemented with 20 ng/ml mouse GM-CSF (R&D Systems, USA) and 10 ng/ml mouse IL-4 (R&D Systems). On days 3 and 5, fresh culture medium including the supplements were added. Immature BMDCs were harvested on day 7 and stimulated with or without different concentrations of rCs RNASET2 (0.05-50 μg/ml) or ESPs (10–160 μg/ml) in the presence of 1 μg/ml LPS (sigma) for 12, 24 and 48 h. Generally, Th1- and Th2-polarizing Ag stimulate DCs via discrete pathways, coupled with distinct modifications of the DC maturation. Therefore, we utilized rCs FABP, a protein has been reported to induce Th1 immune responses, as a control protein [24, 25]. Surface markers on pretreated BMDCs were detected by FCM using the following mAbs: FITC labeled anti-CD11c (eBioscience, USA), PE labeled anti-CD80, anti-CD86, APC labeled anti-CD40 (BD PharMingen, USA). For staining, BMDCs were washed twice with PBS containing 0.1% BSA and 0.05% sodium azide. The cells were thereafter incubated with the respective mAbs for 30 min at 4°C in the dark. Then, cells were washed twice and resuspended in PBS. Flow cytometry was performed on a Beckman Coulter Gallios cytometer and analyzed using the Kaluza software (Beckman Coulter, USA). 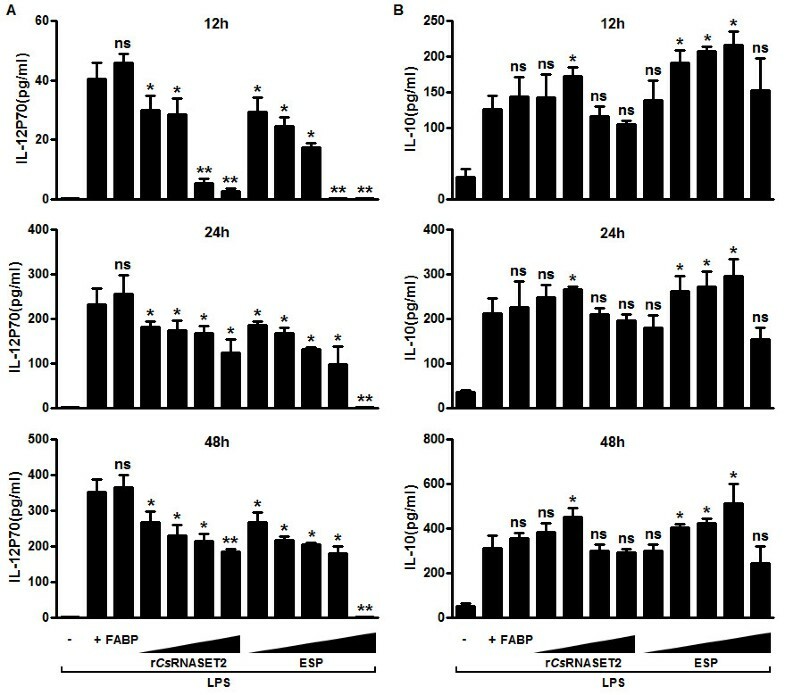 Cell-free supernatants were harvested at different time points after stimulation, and levels of IL-12p70 and IL-10 were assessed by commercially available ELISA kits (eBioscience) according to the manufacturer’s protocol. Sera were collected from rCs RNASET2 immunized mice or PBS immunized mice at 4 and 6 weeks after primary injection. Levels of IgG1 and IgG2a in sera were evaluated by ELISA coated with 100 μl 5 μg/ml rCs RNASET2 each well overnight at 4°C. ELISA plates were blocked with 5% skimmed milk for 2 h at 37°C and then incubated with sera for 2 h at 37°C. Subsequently, the plates were incubated with HRP-conjugated goat anti-mouse IgG1 and IgG2a (invitrogen) for 1 h at 37°C. The optical density was tested at 450 nm. Data were routinely analyzed by the GraphPad Prism 5 software. The Mann–Whitney test was performed to calculate statistical significance of differences between two groups of observations. p -Values < 0.05 were considered statistically significant. The complete coding sequence of Cs RNASET2 contained 690 bp encoding a putative protein of 229 amino acids with the predicted molecular weight of 26.6 kDa. The hypothetical pI of the deduced protein was 5.65. The estimated half-life of Cs RNASET2 was more than 20 hours in yeast and more than 10 hours in E. coli. The instability index of the deduced protein was 35.40, indicating Cs RNASET2 might be a stable protein. Blastx analysis showed that the sequence was a glycoprotein of the T2 ribonuclease family, which contained two critical histidine residues in the CAS motifs. However, the sequence just shared 43% and 39% identity with its homologues from S. janpani and S. mansoni, and it was rich in B-cell epitopes, which might suggest Cs RNASET2 as being a good immunogen (Figure 1). Sequence alignment of RNASET2 from C. sinensis with homologues from other species. The identical amino acids of all aligned sequences are shaded in black. The conserved ribonuclease T2 CAS I and CAS II domains are marked with box1 and box2. Two highly conserved histidine residues in the CAS regions are indicated by black triangles. A N-linked glycosylation site is marked with box3 and an arrow. The B cell epitopes are labeled by dots. GenBank Accession Numbers: C.s, Clonorchis sinensis, [GAA50115.1]; S.j, Schistosoma japonicum, [AAW26577.1]; S.m, Schistosoma mansoni, [ABB73003.1]; F.c, Felis catus, [XP_003986767.1]; H.s, Homo sapiens, [AAH51912.1]; M.u, mus musculus, [AAI00331.1]; R.a, rattus norvegicus, [NP_001099680.1]. We successfully expressed rCs RNASET2 (Additional file 1: Figure S1A) and identified its c-myc epitope and his-tag by western blot (Additional file 1: Figure S1B). The RNase activity of rCs RNASET2 was determined (Additional file 1: Figure S2). We noted that deglycosylated rCs RNASET2 displayed ~4 kDa reduction of molecular weight (Figure 2A). In addition, rCs RNASET2 could be probed by anti-Cs RNASET2, anti-Cs ESPs and C. sinensis-infected mouse sera at a prominent single band around 35 kDa, whereas the protein could not be recognized by sera from naïve mice. In addition, Cs ESPs reacted with mouse anti-Cs RNASET2 sera at a single band around 27 kDa (Figure 2B). These results indicated that rCs RNASET2 was indeed a component of Cs ESPs with glycosylation and RNase activity. Determination of Cs RNASET2 as a component of C. Sinensis ESPs. 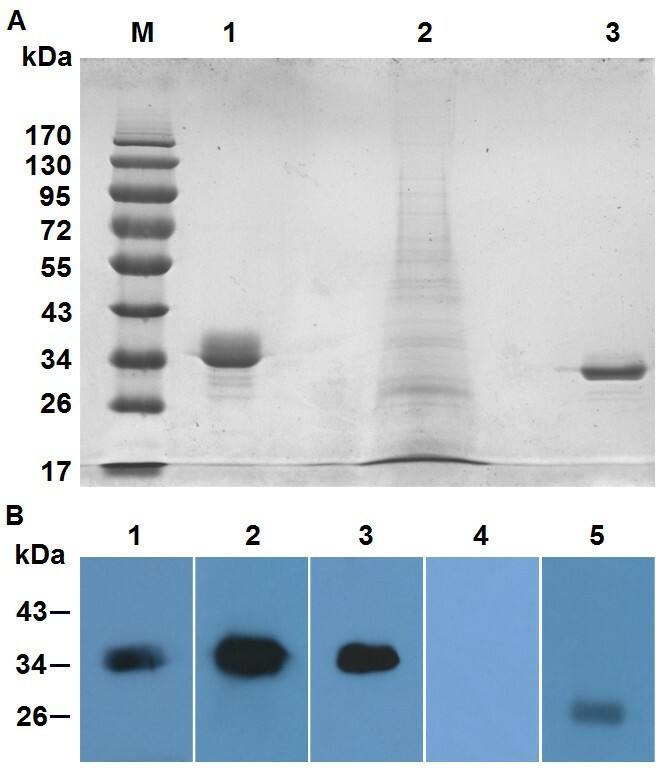 (A) The deglycosylation assay of rCs RNASET2 was evaluated by SDS-PAGE protein molecular weight markers (M); untreated rCs RNASET2 (lane 1); Cs ESPs (lane 2); rCs RNASET2 incubated with PNGase F deglycosylation enzyme (lane 3). (B) Western blotting analysis of rCs RNASET2. The rCs RNASET2 reacted with sera from mice infected with C. sinensis (lane 1); mice immunized with rCs RNASET2 (lane 2), mice immunized with Cs ESPs (lane 3) and naïve mouse (lane 4); Cs ESPs reacted with sera from mice immunized with rCs RNASET2 (lane 5). One of four independent experiments is shown. IL-12p70 and IL-10 are potent adjustive cytokines in the immune system, which can be secreted by DCs [26, 27]. We incubated BMDCs with LPS in the presence or absence of various concentrations of rCs RNASET2, ESP or 0.5 μg/ml rCs FABP. We found that both rCs RNASET2 and Cs ESPs suppressed the LPS-induced up-regulation of IL-12p70 on BMDCs in a dose-dependent manner at the indicated time points (Figure 3A). In contrast, Cs ESPs (20–80 μg/ml) enhanced the expression of IL-10 in a dose-dependent manner, and rCs RNASET2 could promote IL-10 synthesis only at a concentration of 0.5 μg/ml (Figure 3B). In addition, rCs FABP could not obviously interfere with the cytokine production of DCs. Cytokine production by BMDCs in response to r Cs RNASET2. BMDCs (2 × 106/ml) were incubated with 1 μg/ml LPS in the presence or absence of various concentrations of (10, 20, 40, 80 and 160 μg/ml) ESPs, (0.05, 0.5, 5 and 50 μg/ml) rCs RNASET2 or (0.5 μg/ml) rCs FABP. Supernatants were harvested at different time points after stimulation and evaluated by ELISA for expression of IL-12p70 (A) and IL-10 (B). Error bars represent mean cytokine concentrations ± SD (n = 5). Statistical significance was analyzed by the Mann–Whitney test (*p < 0.05, **p < 0.01, ns: not significant). A previous study has demonstrated that helminth antigens can affect the maturation of DCs . To confirm the effects of Cs RNASET2 on DCs maturation, BMDCs were treated with LPS in the presence or absence of rCs RNASET2, rCs FABP (control protein) or ESPs for 24 h, and a series of surface markers expressed on DCs were assessed. In the presence of LPS alone, the expression levels of CD11c, CD40, CD80 and CD86 on BMDCs were raised, when rCs RNASET2 or ESPs were added, the LPS-triggered up-regulation of surface markers was strikingly reduced. In contrast, rCs FABP had no significant effect on the expression of these surface markers (Figure 4A, B). Modulation of BMDCs maturation elicited by r Cs RNASET2. (A) Days-7 BMDCs (2 × 106/ml) were stimulated with or without 0.5 μg/ml rCs RNASET2, 0.5 μg/ml rCs FABP or 40 μg/ml ESPs in the presence of 1 μg/ml LPS for 24 h. The levels of CD11c, CD40, CD80 and CD86 on BMDCs were detected by flow cytometry. Values stand for the percentage of treated cells staining positive for the indicated marker. Histograms are representative of seven independent experiments. (B) Statistical results of the expression of surface markers on BMDCs. Data are expressed as mean ± SD. Statistical significance was analyzed by the Mann–Whitney test (*p < 0.05, **p < 0.01, ns: not significant). For mice, the IgG1 response generally represents Th2-activity, while IgG2a represents Th1-activity . We evaluated the levels of IgG1 and IgG2a in sera obtained from rCs RNASET2 immunized mice. 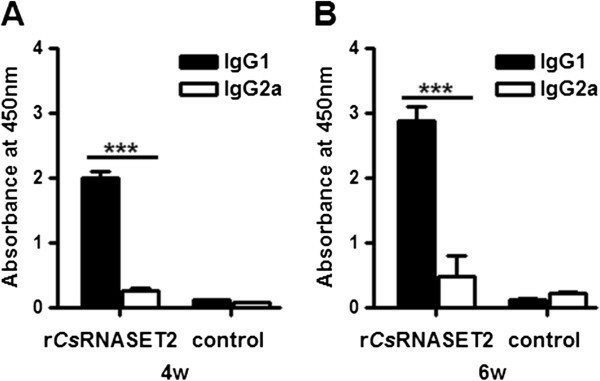 The data shown in Figure 5 shows that administration of rCs RNASET2 triggered a markedly higher IgG1 expression than IgG2a compared with control mice at week 4 (1.99 ± 0.12 versus 0.26 ± 0.04, p < 0.0001) and week 6 (2.88 ± 0.22 versus 0.49 ± 0.31, p = 0.0002). IgG subclass responses triggered by r Cs RNASET2. BALB/c mice (n = 6) were immunized s.c. with rCs RNASET2. After 4 (A) and 6 (B) weeks, sera levels of IgG1 and IgG2a specific for rCs RNASET2 were evaluated by ELISA. IgG1 levels were significantly higher than IgG2a at both 4th and 6th week. Error bars represent mean levels ± SD. Statistical significance was analyzed by the Mann–Whitney test (***p < 0.0005). It is well demonstrated that DCs are dominant players in the initiation and sustenance of immune responses [19–22]. In general, DCs undergo activation, termed maturation, upon recognition of invading pathogens, such as viruses, bacteria, and fungi. In the process of maturation, DCs up-regulate the production of surface markers and polarizing cytokines [20, 21]. However, recent studies have indicated that DCs exposed to antigens derived from parasitic helminths fail to induce the classical DC activation [30–32]. The maturation status of DCs is crucial for the initiation of primary immune responses. It has been documented that Sm omega-1, a RNase T2 family glycoprotein present in ESP, is a major molecule to dramatically modulate the maturation of DCs in S. mansoni infections [14–17]. Since Sm omega-1 has been reported to play a potent role in the process of DCs modulation, we wondered whether there was a counterpart present in Cs ESPs with similar activity. In this study, we firstly identified a gene encoding Cs RNASET2, which also appeared to be a glycoprotein of RNase T2 family. All RNase T2 enzymes have two blocks of conserved amino acids (termed CAS I and CAS II) [8, 9]. These regions have typical catalytic residue of one to three histidine residues [8, 33]. 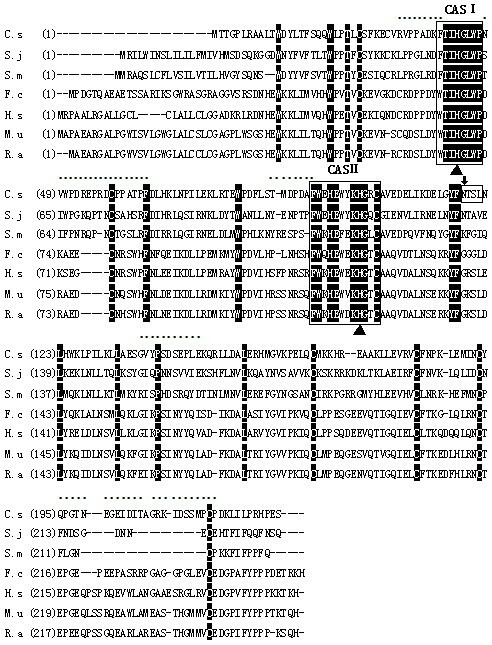 Sequence analysis showed that Cs RNASET2 indeed harbored the two conserved CAS I and CAS II regions with two critical histidine residues (Figure 1). It suggested that Cs RNASET2 was the counterpart of Sm omega-1. We expressed rCs RNASET2 in P. pastoris with RNase activity. Deglycosylation experiment displayed ~4 kDa size reduction of the rCs RNASET2 (Figure 2A), which indicated the rCs RNASET2 was indeed glycosylated. rCs RNASET2 could react with C. sinensis-infected mouse sera and ESPs immunized mouse sera, meanwhile, ESPs could be probed with mouse anti-rCs RNASET2 sera at a single band (Figure 2B). These results revealed that Cs RNASET2 was indeed a component of Cs ESPs, which are in accordance with the fact that the RNase T2 family members are typically secreted [9, 34]. The difference of 8 kDa in molecular weight between rCs RNASET2 and the native protein in ESP might be due to his/myc-tag, a minor imprecision on SDS-PAGE assays and glycosylation (~4 kDa reduction). Meanwhile, we performed western blot analysis, in which ESP reacted with anti-rCs RNASET2 and anti-ESP mouse sera. Gradation analysis revealed that Cs RNASET2 took up about 2% of ESP (Additional file 1: Figure S3). Furthermore, ELISA assays revealed that the LPS-induced up-regulation of IL-12p70 on BMDCs decreased in a dose-dependent manner in the presence of various concentrations of rCs RNASET2 or Cs ESP (Figure 3A). In contrast, Cs ESPs (20–80 μg/ml) enhanced the expression of IL-10 in a dose-dependent manner, and rCs RNASET2 could promote IL-10 synthesis only at a concentration of 0.5 μg/ml. Higher concentrations of rCs RNASET2 or ESP failed to promote IL-10 production (Figure 3B). We then performed BMDCs survival assay with Cell Counting kit-8 (CCK8) under different concentrations of rCs RNASET2 or ESP, and observed that higher concentrations of rCs RNASET2 or ESP could inhibit cell viability (Additional file 1: Figure S4). Therefore, we finally chose 0.5 μg/ml of rCs RNASET2 and 40 μg/ml of ESP as moderate working concentrations. Cs FABP, a Th1-polarizing Ag, was utilized to be a control protein. There was no significant difference of cytokine production levels when rCs FABP was added. 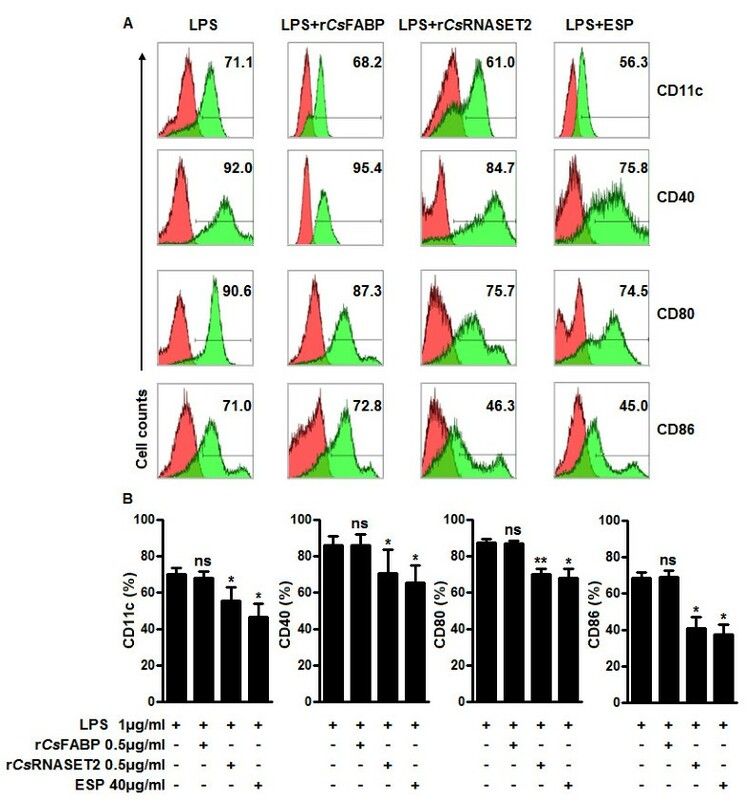 Subsequently, we carried out flow cytometry analysis and noted that levels of surface markers including CD11C, CD40, CD80 and CD86 on rCs RNASET2- or Cs ESP-treated BMDCs significantly decreased compared with LPS controls, whereas rCs FABP displayed little effect on these surface makers expression (Figure 4). These results demonstrated that rCs RNASET2 could modulate the cytokine production and maturation of DCs. Interleukin-12 (IL-12) plays the key role in the generation of Th1 cells. IL-12p70 is a heterodimeric cytokine composed of two chains (p35 and p40), which is able to stimulate NK cells and T cells to produce IFN-γ to resist against pathogens . It has been well established that IL-10 is a cytokine secreted by CD4+ T cells belonging to the Th2 subset, which has been determined to suppress the production of IFN-γ. The induction of IL-10 may be an important strategy by which parasites evade IFN-γ-dependent, cell-mediated immune destruction . Our experiments showed diminished expression of IL-12p70 and increased expression of IL-10 in rCs RNASET2-cocultured DCs. Therefore, it is conceivable that rCs RNASET2 co-cultured DCs may suppress Th1 polarization, which is eventually beneficial for C. sinensis escaping from the host immunity. IgG2a and IgGl immunoglobulin isotypes are generally regarded as markers for Th1 and Th2 responses respectively [29, 37]. Our studies demonstrated that the up-regulation of IgG1 was greater than that of IgG2a (Figure 5), confirming that Th2 responses might be dominant in rCs RNASET2 immunized mice. These results were in agreement with the data obtained from rCs RNASET2 co-incubated BMDCs, as reduced expression of IL-12p70 and increased production of IL-10 could inhibit Th1 polarization. However, it is difficult to determine the dominance of Th1 or Th2 responses on the basis of IgG isotypes alone, because the initiation of B cell isotype switching is not only confined to the mutual effects of Th1 and Th2 cytokines. Further studies are required to determine whether Cs RNASET2 is able to trigger Th2 or Treg responses through DCs modulation, whether this function is associated with its RNase activity, and which pathways are involved in the process. Collectively, we cloned and identified Cs RNASET2 as a molecule present in C. sinensis ESPs. We confirmed that rCs RNASET2 could regulate the host immune response via modulating DCs maturation, as well as production of IL-12p70 and IL-10. We also observed that administration of rCs RNASET2 to mice could alter the IgG1/IgG2a ratio. It will be of significant interest to investigate whether Cs RNASET2 is able to initiate Th2 or Treg responses through modulating DCs, which will pave the way towards unraveling the regulatory mechanisms of the immune responses in C. sinensis infection and may provide potential therapeutic tools. This work was supported by grants from the National Key Basic Research and Development Project of China (973 project; No.2010CB530000), the National Important Sci-tech Special Projects (No. 2012ZX10004220), National Natural Science Foundation of China (No. 81101270 and No. 81171602), the Fundamental Research Funds for the Central Universities (No. 3164015) and Sun Yat-sen University graduate student funding for abroad visiting and international cooperation research projects. YQX, XNZ, YH and XBY conceived and designed the experiments; YQX, WJC, MB, XYW, JFS, HCS, FFJ, CL, XRL performed the experiments; YQX, WJC and MB analyzed the data; YQX, WJC, XYW and YH wrote the manuscript; All authors read and approved the final manuscript.